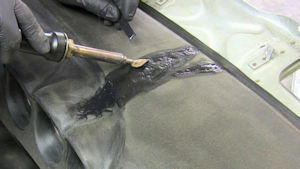 This Datsun 280Z dash has a large split in the vinyl exposing the underlying urethane foam. 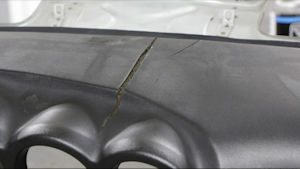 The vinyl is puckered at each edge which will require a fairly wide repair. 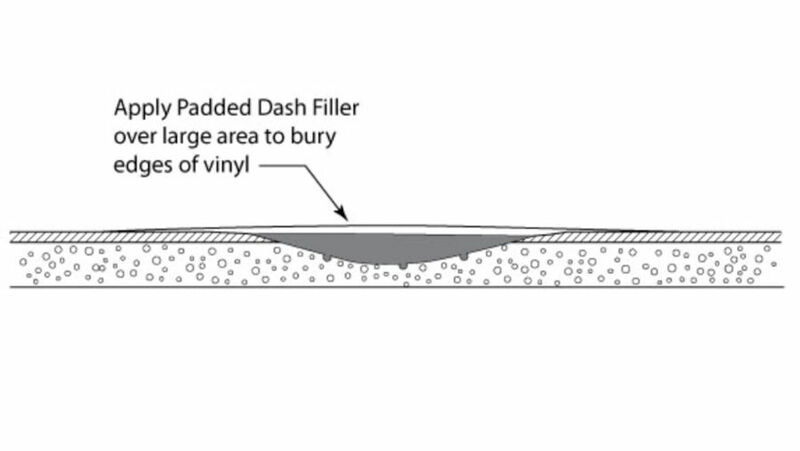 This drawing shows a cross section of the damaged dash with the split vinyl curling up and the cratered out foam underneath. This is the first step of the repair sequence – opening up the crack and removing the curled up vinyl. 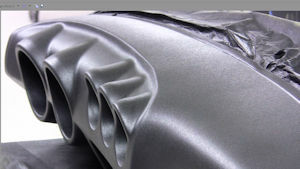 You should bevel the edges of the vinyl as much as possible to make a smooth transition. The next step of the repair process will be to fill the missing foam with FiberFlex welding rod. 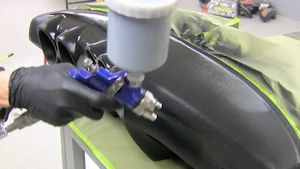 Note that the FiberFlex is applied over the edges of the vinyl. 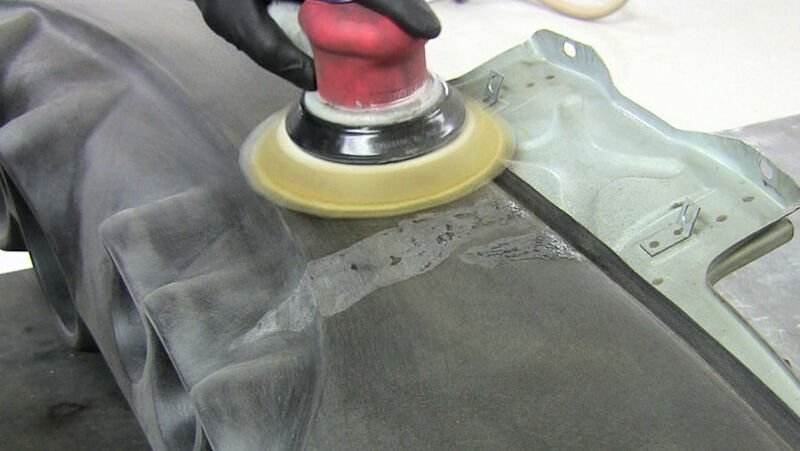 Our last step will be to apply Padded Dash Filler over the entire area, making sure the edges of the repair area remain buried underneath to minimize any haloing effects. The first step is to clean the surface with 1000 Super Prep plastic cleaner to remove any silicone dressings that may have been applied. 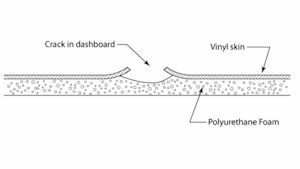 Then, using a Dremel tool with a drum sander, or a rotary sander, sand back the puckered vinyl cover until the cover is fairly flat. Sand back to expose vinyl that still has a solid connection to the underlying foam. V out the urethane foam with the sander to expose foam underneath. 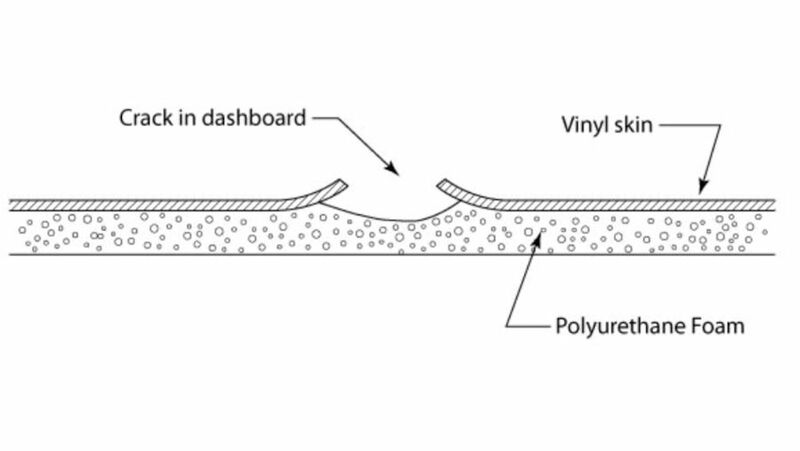 Bevel the edges of the vinyl as much as possible with the sander. Feather back the repair area with 80 grit sandpaper in a dual-action sander. 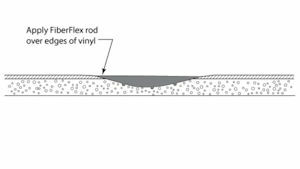 Use a Polyvance airless plastic welding tool with the FiberFlex welding rod to fill the v-grooved foam completely. 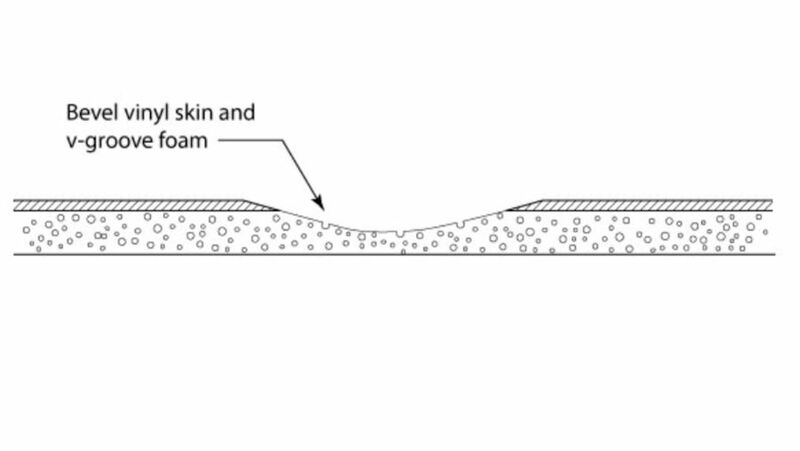 The FiberFlex will link into the foam and form a solid, yet flexible, foundation for the filler that will be applied. 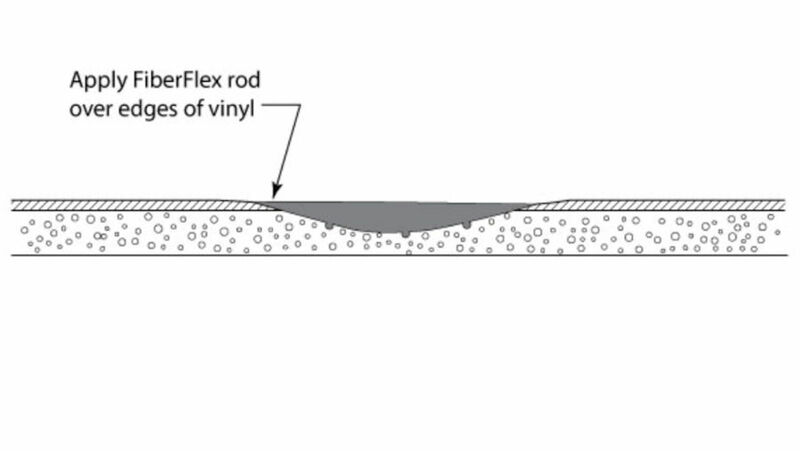 Once the FiberFlex cools, sand flush with 80 grit in a DA sander. If any low spots remain, reapply FiberFlex, let cool, and sand again. Blow the area dust free with compressed air. 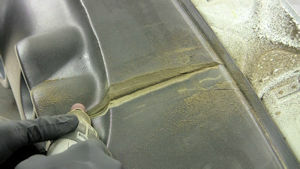 Apply 1060FP Filler Prep to the area that will be filled. 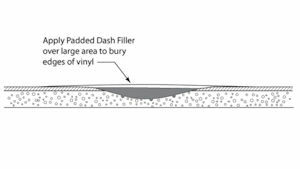 Mix 2050-9 Padded Dash Filler with cream hardener. Mix completely until the putty turns a uniform color. 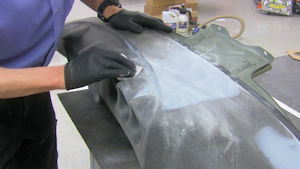 Apply Padded Dash Filler over the repair, several inches on either side of the welded area to bury the edges of the v-grooved area. Sand filler with 80 grit, then 180 grit sandpaper. When finished, the filler should still cover the edges of the vinyl so as to keep them buried under filler. Sand the entire dashboard with 80 grit sandpaper to remove much of the existing texture. Apply 1050 Plastic Magic over all to help the primer stick to the dashboard. Apply a Polyvance waterborne primer to fill the existing texture. Sand overall with 240 and 320 grit paper. 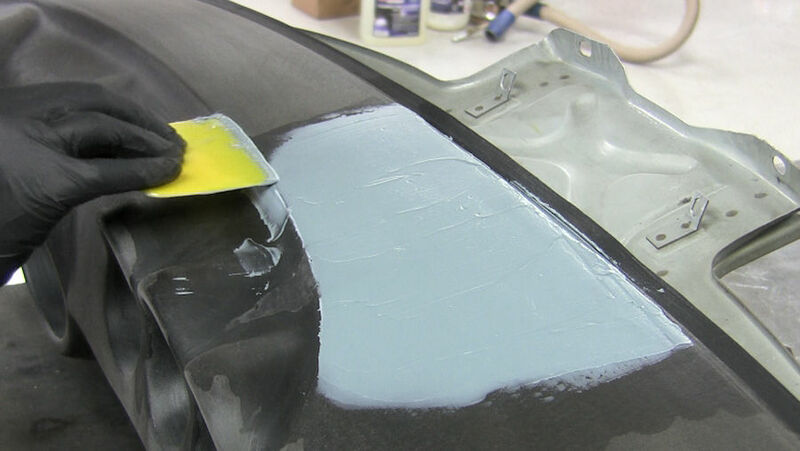 Apply spot putty over the repair area if necessary, sand, then reapply primer. Keep sanding and priming until the surface is fairly smooth and the repair area is hidden. The dash can be retextured with our Flextex VT. Apply three light coats by “splattering” the paint droplets on the surface to simulate texture. You need an air compressor and a spray gun to apply Flextex VT. If you don't have either one of those, a decent substitute is an aerosol texture spray from a company called SEM Products. We supply this product for your convenience. For more control over the texture appearance, use Polyvance’s Flextex VT texture spray with a 2.0 nozzle spray gun. 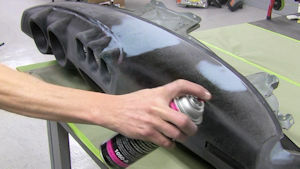 Apply three light coats by splattering the paint droplets on the surface. Keep the gun moving and don’t allow the paint to load up or flow out. 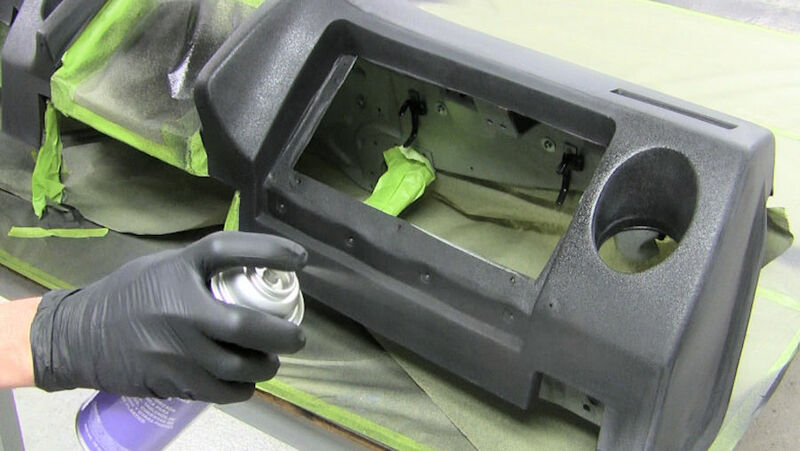 The finished dash looks nearly brand-new thanks to plastic repair products from the innovator in plastic repair, Polyvance.